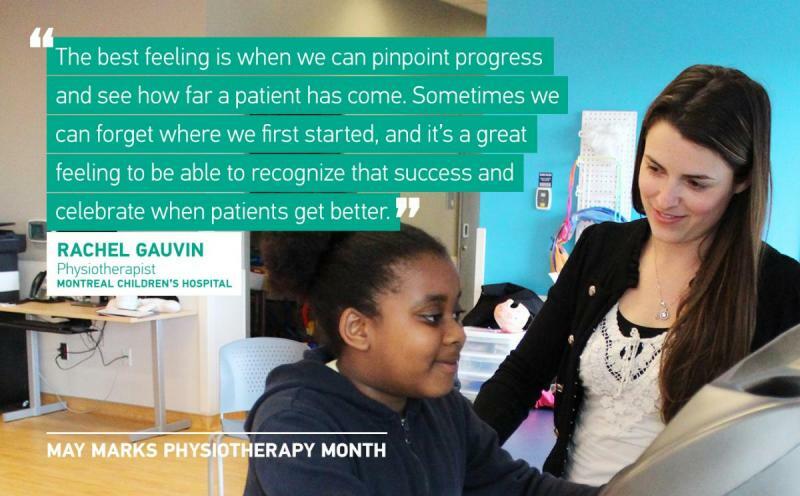 The month of May marks Physiotherapy Month in Canada: a chance to highlight the work of our dedicated physiotherapists, working with diverse patient populations throughout the Montreal Children’s Hospital. Join us in thanking all of our physiotherapists for the outstanding work they do to support our patients, families and fellow health professionals day in and day out. While most of her patients are teens with chronic illnesses, chronic pain can also present itself in younger children in many different ways. Rachel’s work begins with a physical examination to assess a patient’s flexibiliy, range of motion and strength, but also includes a subjective evaluation to understand when they are experiencing pain and how long it lasts so that she gets a better picture of where they are starting from with the goal of increasing their overall functioning through activity.